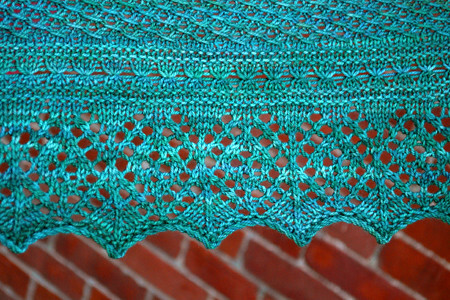 One can argue that omitting the entire nupp section of Miralda’s Triangular Shawl simplifies the design so much, that it’s no longer on par with other Knitted Lace of Estonia patterns. And even though that may be true, the modified version has its own appeal: clean lines, squishy texture, and mindless enough to knit while watching TV. 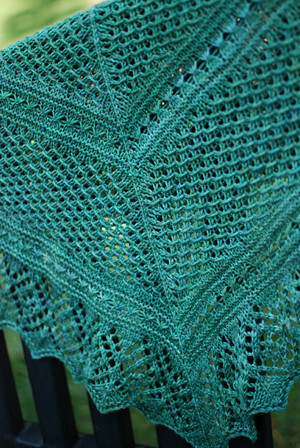 Pattern: Miralda’s Triangular Shawl from Nancy Bush’s Knitted Lace of Estonia (my review here). I omitted the nupp-containing section, and slightly modified the decreases at the nape of the neck so the top edge of the shawl came out straight. No other notable changes. Yarn: Ball and Skein Sophia, 80% merino, 10% cashmere, 10% nylon, 450 yards per 160 gram skein. The shawl used up about 560 yards/200 grams of yarn. I alternated the two skeins in large chunks, switching between the big elements. Needles: US 6 INOX Express circs. Finished size: 52″ across the top, and 26″ deep. I think this is one of the smaller shawls I’ve knitted, but it should work very well for wearing under a winter coat. So. I still haven’t decided what to do with this shawl. It’s definitely not my color. It’s not exactly my grandma’s color, either – she’s more of a “sage green” woman. Maybe my mom? I think I will put it away for now; the right person or occasion will come along eventually ;). Until it comes out again, let’s enjoy the gorgeous texture! It’s beautiful! I have made this twice, once for myself out of Zara which I love, and once for a gift (can’t recall the yarn), but I love the idea of a smaller version without nupps. did the math for the next section work out without the nupps? I can be “math-challenged” with patterns, sometimes. It’s lovely – I don’t miss the nupps at all. That is gorgeous! And as a non-lover of The Nupp, I would have passed over the original version – this is temptingly lovely! I love everything about that shawl so very much. It’s so perfect without the nupps. This is beautiful. I love the design and nupps or no this is simply stunning. It’s beautiful! The changes are wonderful, and make a gorgeous shawl. It is great! Great color, nice design. Complex enough to look interesting, but not so complex as to look confusing. Maybe I shouldn’t be reading your blog if I’m the only one who has no idea what nupps are! I love it just the way it is. I’m not a lover of the nupp either. And the size is perfect. The color is beautiful too – it’s one of “my” colors so I loved it right away. This is beautiful just the way it is. I like it without the nups. I have the book, but have been a bit put off by the nups (I hate bobbles). It’s great to see how well one of the patterns can turn out sans nups. Wow! I have started Miralda and am up to the “nupp-part”, it’s in toshlace in a pinky-purply color (Ms. Taylor) and it’s been stopped while I consider whether I’ll follow you…I am not a nupp lover (swallowtail nearly did me in! ), so I think I might try your version – thanks for sharing! It’s really gorgeous! I think I prefer your nuppless version. Wow. Nuppless sounds REALLY dirty. Heh. 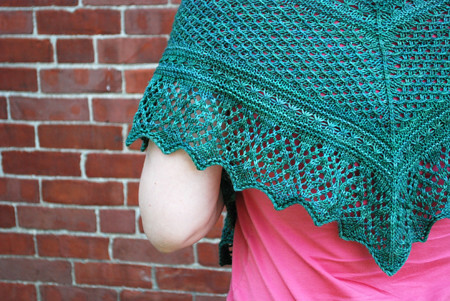 I really love the texture in that shawl. I’ll have to check the book for the original version with the nupps but I don’t miss them here at all. I also think that the color in the yarn is gorgeous. Great job! Your shawl is absolutely beautiful! One of the prettiest I have ever seen. Such a talented knitter! lovely! the semi-solid-ness of the yarn really brings out every single stitch in those textured patterns. I’ve touched that ball and skein yarn at the NH sheep and wool festival – it’s AMAZING!! I can’t even knit feather and fan stitch without being in a dead quiet room all by myself and counting every stitch out loud. Yum! I love everything about this shawl. Sigh. My list of “to do’s” grows longer. It’s gorgeous! It’s definitely one of my colors, though I find lately that I’ve been moving my knitting palette to the lighter colors to show off things like cables and certain types of colorwork better. I think it looks great and great on you! Your shawl is beautiful, and no less so for being nupless. 🙂 Thanks for stopping by the other day to comment on Red Oak. Although I don’t participate in the blogging world as much as I would like these days, I miss my “old friends” and it is really nice to hear from you. It is certainly still beautiful without the nupps. I’ve heard quite a bit of grumbling about them. Maybe this will get more people knitting from the book. Gorgeous – I like the clean lines even better than the original. Great job! Love the teal (it *is* my color :), love the pattern! Just gorgeous. Absolutely beautiful. If you know someone who loves the sea, the color would make that person drool. Beautiful shawl, Kathy. Beautiful color, beautiful texture, perfect. I’m going to have to check out Knitted Lace of Estonia closely when I get back to knitting. It would a gorgeous color on me -especially to hide the shoulder immoblizer after my surgery. (just sayin’… Isn’t it sad that a torn rotator cuff is keeping me from knitting, crochet and sewing? That is so beautiful. I think the colourway is a perfect compliment to the texture of the pattern. I was surprised to read this is not your color! The whole time I was thinking what a great color. Oh well, I guess it’s possible, but strange 😉 I think it is absolutely gorgeous! Lately, each of your post is an eye candy and inspiration to me! Have a great weekend! i love it. it’s absolutely gorgeous and one of my all-time favorite colors. Good Lord I do believe that is the perfect shade of teal, K! 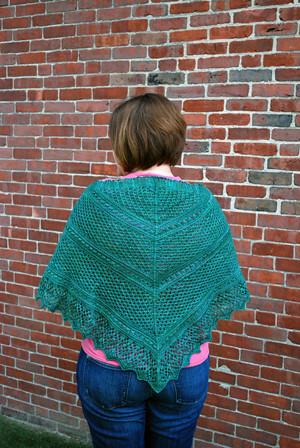 I hadn’t seen the miralda, so I went on Ravelry and while it is beautiful, I really like yours better. Love love love the border. I keep coming back to this shawl! You know, I like the simplified version better! It’s so balanced and zen-like. I will have to knit one for myself.